HJ: Until we consciously decide to begin letting go, we are unconsciously attached to every experience we’ve had in life, good, bad and everything in between. In Zen philosophy, the middle path, the path of balance is what one works to achieve. This is a state free of attachement to either the good or the bad, the positive or the negative. Why would you want to achieve this? That is, non-attachment, or put another way, the ability to release anything and everything? Because attachment itself to happiness, sadness or any other emotion or idea is the cause of all suffering. Your subconscious mind is like a tape recorder. It indiscriminately records whatever is happening to you and stores it deep within your memory. Anytime in the future that an event or circumstance occurs that is somehow related either directly or tangentially to a past experience, your subconscious mind replays the experience, calling up the associated thoughts, which then trigger the associated emotions and so on. As you might be beginning to see, this can go either way. It may call up a pleasurable response, or if the experience was traumatic, it can cause us to re-experience the emotional pain that we originally felt when the traumatic incident occurred. Typically we repress, escape or express emotional pain, but rarely, if ever, do we release our emotional pain permanently, which is absolutely possible and exactly what the article below shows you how to do! Until we let go of the emotional charge surrounding an event we are attached to it, whether it is positive or negative. Being attached to a positive feeling, keeps us locked into addictive patterns and seeking, whereas being repulsed by a negative feeling keeps us locked in escapism and neuroses. Either way, suffering is involved simply based upon our attachment to a feeling or idea. The Zen path is the art of letting go. Not being attached to any particular feeling, person, event or idea. This is true freedom and a major aspect of enlightenment. And if you seem to feel stuck no matter what you do, be it yoga, meditation, any type of self improvement, any technique any mindfulness practice and so on… if these all seem to help a little but not quite take you where you truly want to be, which is full liberated consciousness, experiencing all the love, abundance, peace, happiness and health you can handle, then you need to let go of the emotional charges and patterns locked in your subconscious mind. Letting go has been the cornerstone of Hale Dwoskins life work and he is a master in every sense. Below, he reveals the essence of The Sedona Method, one of the most profound techniques in existence for letting go of anything and everything which does not serve you and stands in your way of creating all the incredible things I just outlined above. You have probably heard the Serenity Prayer. And if you’re like most of us, at times you still find yourself waiting for an answer. We live in a world that seems anything but serene. We are bombarded by all forms of media. Our personal lives no longer feel like our own. The world often feels like it is spinning out of control and that is all on a “good” day. In this post we explore a way to accept the things that you cannot change and how to bravely changing the things in your life that need to be changed. As you explore the material in this post you will also gain wisdom to distinguish between the two. What is the answer? It is so simple that it may confound you. 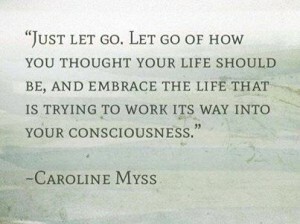 Let go of the feeling of wanting to change it. “It” being anything in your life or within the scope of your personal experience that you do not like and want to be different than the way it is, including events in the past. If you remain open to the elegance and simplicity of this solution, it has the power to set you free and create greater happiness and harmony in your life. It is also a way for you to become a driving force for good in your world. How does letting go of wanting to change things help us? Besides the obvious outcome of feeling better as we let go, there are several ways. Let’s start by looking at acceptance. Accepting what we can’t change is not always easy. The mind rebels at the whole notion. However, when we let go of wanting to change the way things are, we naturally move into greater acceptance without having to try to force it to happen. In regards to changing the things that need to be changed, examine your personal experience. Quickly review your life and make a mental list of anything you want to change. It is probably quite lengthy and many of the items on this list are longstanding. So far, many things you’ve wanted to change have not changed, right? Although the mind informs us that the desire to change something can actually change it, or that wanting to change what needs to be changed will cause us to take an action, in most cases the exact opposite is true. When we are focused on wanting to change a problem, our awareness of the problem causes it to persist. We hold the issue in mind in order to change or resist it. Here is how this works. Perhaps we have an experience that we don’t like (the boss yells at us), or something happens to a person we care about (a friend gets sick or has a car accident), or maybe we don’t like the news we hear that day (the stock market takes a nose dive). Therefore we want to change it. Either we think, “I hope this doesn’t happen to me,” or, “I hope this never happens again.” Which is where we get stuck. Since the mind sees and creates in pictures, it doesn’t accurately translate negations, words like not, never, or don’t. As a result, it interprets our hopes in reverse and sustains them. If you don’t believe me, try right now to not picture a shoe. What happened? If you’re like most people, you immediately saw a shoe in your mind’s eye. The harder we try to not create what we do not want, the stronger we’re holding on to the idea, and thus, the more likely we are to create it in our reality. So what is the solution? Let go of the sense of wanting to change something and the unwanted pictures about it that you were holding in mind will dissolve, and then you’ll courageously move into action to make the changes that are necessary. Find something in your life that you would like to change. Welcome the feeling of wanting to change it. Ask yourself: Could I let go of wanting to change this? (Pause for the release.) Would I? (Pause for the release.) When? Repeat steps two and three as many times as needed until you feel lighter and more serene. Get into action if there is something that you can do about it and just drop it and move on if there is nothing to be done in this moment. Either way, enjoy your newfound serenity. I highly encourage you to explore this perspective and this process in your own life to liberate yourself and fill our world with joy and serenity. You can also join ourReleasingFest this September for some great free support in applying this in your life. This post is based on the principles explored in his book The Sedona Method; Your Key to Lasting Happiness, Success and Emotional Wellbeing. It is based on over three decades of experience with a simple, powerful, elegant and easy-to-learn technique that shows you how to tap your natural ability to let go instantaneously of any uncomfortable or unwanted feeling, thought or belief. For more information, visit www.Sedona.com.